Okay it may be October but it doesn't stop an ice-cream lover like myself from going on the hunt to find the perfect treat. I first saw Chin Chin Labs on instagram featuring on my most popular page and couldn't stop scrolling. They were beautifully formed balls of delicious ice-cream made from liquid nitrogen with intoxicating flavours. Thinking about it, I'm glad I didn't go in the summer as the guy in the shop said the queue is normally around Camden lock... no thank you. Situated in a tiny little shop, Chin Chin Labs looks like a small factory with lab equipment inside. Very rustic with not much decoration but it's not needed as you're too busy watching the wonderful ladies making the liquid nitrogen ice-cream. I chose the Burnt Butter Caramel and with that comes a free topping but because it's me I had to have two. I asked what else to have that went well with what I had already chosen and he said that the truffle crumble was his favourite as it adds a savoury side to the ice-cream. It was made from mushroom butter and truffles. However to me it tasted like a glorified Oreo.. not that I was complaining. Andrea chose the "Cookiewich' of which vanilla ice-cream shoved in between two gorgeous cookies. We were both mesmerised by the ice-cream 'batter' which was being poured into the mixer and -196c liquid nitrogen was added. It was like watching a wizard making a potion. Smoke filling the kitchen. After taking so many photos, I realised that because the ice-cream was so cold it didn't melt one bit until Andrea and I were holding it in our hands after a while. Obviously freezing ice-cream at -196c it would take a while to melt. Now I have tried many ice-creams in my 21 years of life but I must say this had the smoothest finish. It was so creamy and the flavour was so intense. Although it was only one scoop it seemed to last a long time with the added toppings it was like eating a weird and wonderful dessert. Different textures and flavours all exploding in your mouth at once. I wanted to try al the flavours but after one scoop it really was enough for my sweet tooth. 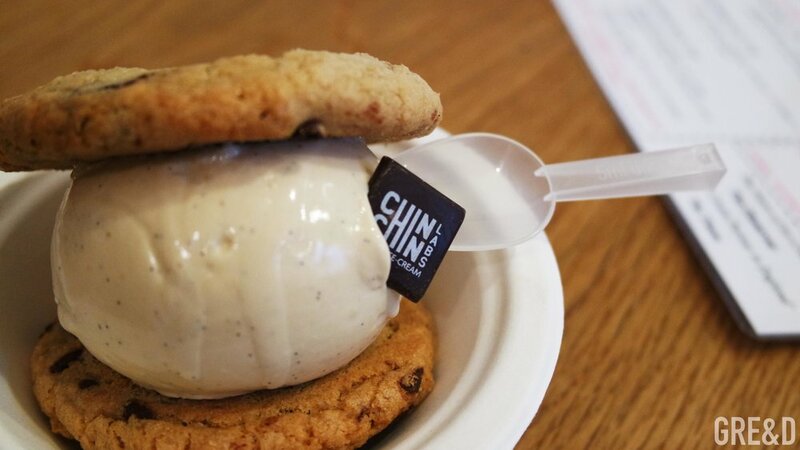 What is wonderful about Chin Chin Labs is that you are able to buy most of toppings that they supply for you to take home and enjoy. Costing £5 per bag its a great way to spruce up your ice-cream!